We are a team of professional mobile marketers dedicated to helping you make a big noise in the app ecosystem! We are award-winning and obsessed with mobile apps. We are experienced. 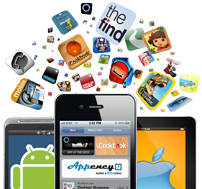 Established in 2009 as the first app specific full service marketing agency by mobile industry veterans, Appency has worked with everyone from Fortune 500 businesses to small independent developers with success.